The vast majority of back problems improve on their own or with nonsurgical treatment. 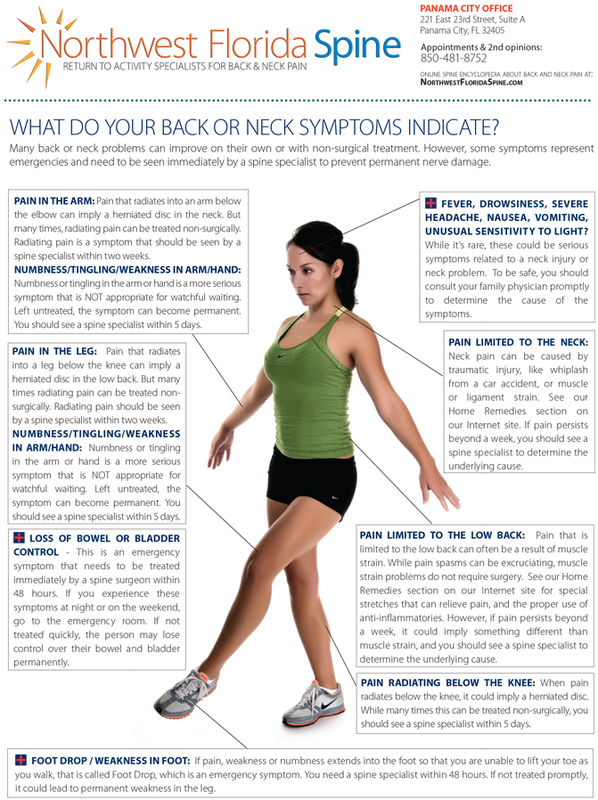 There are a few warning signs, however, that may indicate serious spinal problems. If you experience any of these symptoms, seek medical attention immediately. Loss of control of the bowel or bladder and retention of urine may indicate damage to the spine's cauda equina nerves. The cauda equina is a bundle of nerves in the low back where the spinal cord ends. Damage to these nerves can be permanent if not treated immediately (within a day or so). See a spine specialist, or go to an emergency room if necessary. Weakness or numbness in a leg or arm, especially if it is severe—and it is getting worse—also points to nerve damage. This includes "foot drop," a condition where the muscles of the leg and foot are too weak to raise the foot up as the individual attempts to walk. Again, nerve damage associated with these symptoms can be permanent if not treated immediately. This problem should be seen within 24 hours by a spine specialist. Numbness, pain or tingling that radiates into the arm or leg is also a source for concern and should be seen within a few days by a spine specialist. High fever accompanied by back pain may indicate a possible infection of the spine and should be treated within 24 hours. Trauma - If you fall down, are in a car accident, or do anything abrupt that may have fractured your back, go to a spine specialty clinic within 24 hours. Radicular pain - Anytime you have back or neck pain that radiates down into your leg or arm, you probably need to be evaluated by a spine specialist within two to three days, especially if it is getting worse. Persistent pain - If pain limited to the low back or neck area does not begin to subside after three days with anti-inflammatories and rest, then you probably need to be evaluated by a spine specialist. For example, if you first noticed back or neck pain on Monday, and it's now Thursday, and it's not getting better, it's time to see a spine specialist to find out what is causing your problem. Anytime you experience loss of control of your bowel or bladder, that is an EMERGENCY signal that you need to see a spine specialist THE SAME DAY. If you wait too long, you could suffer permanent paralysis of the nerves that control these functions. Foot drop - If you notice that your toe is dragging as you walk, this is a DANGER SIGNAL for serious problems. Again, if you delay, you could experience permanent damage. This problem should be seen within 24 hours by a spine specialist. Weakness, numbness or pain that extends below a knee or elbow is a serious symptom. Go to a spine center within two days.